Yeah, it is an elliptical problem. 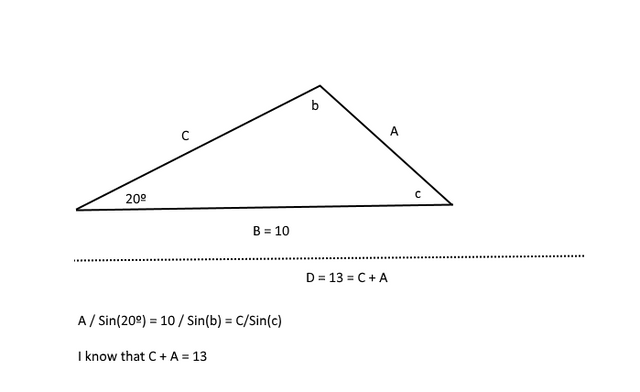 I know I am missing data to complete the use of the Sine Rule to solve it, but I am just wondering if knowing that C+A is already a known value might help. Just I cannot see it. There are other ways to solve it, I know, but I wanted to see if it can be done with the Sine Rule. You can't do it this way unless we know what, geometrically, D is? $b+c=160^o$, so you have two equations in two unknowns. Eliminating A gives sin(160° - b) = (13/10)sin(b) - sin(20°), which leads to b = 87.0169° approximately. Thank you. Yes, I imagined it came down to a best estimate, I just wondered if I might have been missing something.